Use any Metabolic approved vegetables you’d like (yellow squash, zucchini, portobello mushrooms, red onions, etc.) Use leftovers in a salad over fresh arugala or spinach. Preheat grill to high. In a medium bowl, combine parsley, oil, garlic and salt; add vegetables and toss to coat. 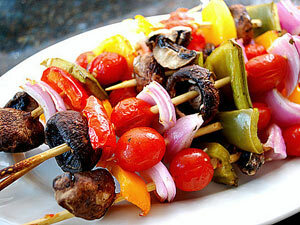 Thread vegetables onto 4 long skewers. Grill, turning once, until tender and charred, about 6 to 10 minutes, depending on desired degree of doneness. This entry was posted in Entrees, Metabolic Medical Center Recipes, Modified Profast (Fast and Flexible) Recipes, Nutriplus Recipes (Balance Your Pyramid), Salad, Uncategorized, Vegetables and tagged appetizer, dinner, easy, Facebook, grill, long skewers, main dish, onion, portobello mushrooms, red onion, Salad, side dish, Vegetable, vegetarian by foodies4mmc. Bookmark the permalink.